In Shemot 3:6 HaShem introduces Himself to Moshe and says: 'I am Elohei Avicha, Elohei Avraham, Elohei Yitzchak and Elohei Ya'akov'. In verse 13, Moshe asks HaShem which name he should tell the people and HaShem replies: 'Ehyeh Asher Ehyeh,' and tells him he should tell them that He is Ehyeh, and that He is HaShem, Elohei Avraham, Elohei Yitzchak and Elohei Ya'akov, and that this is His name for eternity from generation to generation. And even to the Ziknei Israel Moshe has to say that He is HaShem Elohei Avoteichem, Elohei Avraham, Yitzchak v'Ya'akov. Eventually Moshe has to tell Pharao that He is HaShem Elohei HaIvriyim. And to the Israelites Moshe has to show different signs in order for them to believe that He is indeed HaShem Elohei Avotam, Elohei Avraham, Elohei Yitzchak v'Elohei Ya'akov. In Shemot 4:31 it says that the people believed that He was HaShem. But after Moshe visit to Pharao he gave the people harsh labour and then something changed..
Why is it that Moshe has to introduce HaShem? Didn't the people know who HaShem was? And why does it seems like Moshe has to reintroduce HaShem to the people in Shemot 6:6-7? And last but not least, when was it that the people knew HaShem? Question 1) Bnei Yisrael worshiped Avodah Zarah in Egypt; see Yechezkel 20 and Idolatry in Mitzrayim? Thus, Moshe would have needed to remind his brethren that the G-d of their forefathers still cared about them. And God spoke unto Moses, and said unto him: ‘I am the LORD; and I appeared unto Abraham, unto Isaac, and unto Jacob, as God Almighty, but by My name (Yud-Kei-Vav-Kei) I made Me not known to them (Translation from Sefaria). And I did not reveal my Yud-Kei-Vav-Kei name to them... For that, my name was called Yud-Kei-Vav-Kei- faithful to the truth of my words. And Aaron spoke all the words which the LORD had spoken unto Moses, and did the signs in the sight of the people. And the people believed; and when they heard that the LORD had remembered the children of Israel, and that He had seen their affliction, then they bowed their heads and worshipped. Chapter 3 of Exodus makes a lot more sense when you divide it according to the Documentary hypothesis. Dividing up the chapter into two sources, A Jahwist source an Elohist source, you actually get two separate stories. 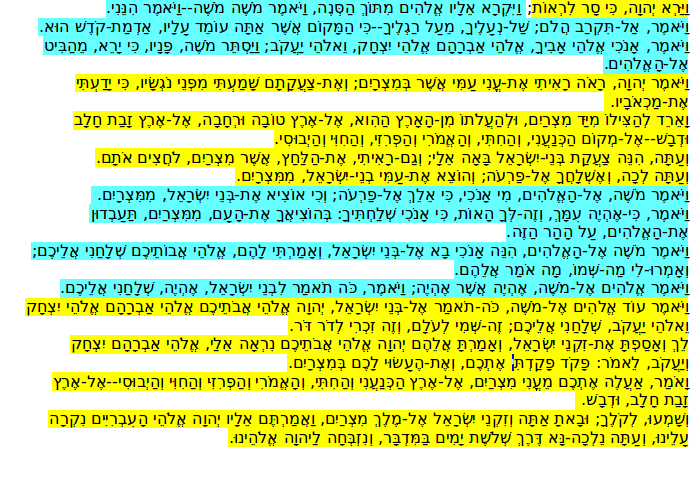 Thus, singling out the J passages in yellow, and the E passages in blue*, you can cleary read each colored text as a completely independent story. The J source shows an all powerful known God, the god of Abraham that is already promising the future conquest, with Moses nearly absent. The E passage shows a very human Moses, with a unknown God, and unnamed forefathers. So, to answer your questions, In source J, They people of Israel already know who YHWH is, as the God of Abraham. Therefore, Moses just needs to prove it was YHWH who actually sent him, as evidenced by his questions. In source E, The people of Israel don't know about God yet, and Moses expects them to ask about the name of the particular god that sent him. *This division is my own, and is just a sample division which for simplicity ignores any other later sources (EJ and R). the exact division has been subject to various academic debates, e.g. in this paper from 1921. Not the answer you're looking for? 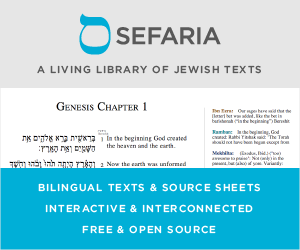 Browse other questions tagged commentaries parashas-shemos va-eira shemot-exodus . What name of G-d was Moshe supposed to relay to B'nai Yisra'el?